In a small saucepan, melt butter. Remove from heat and add 1 cup S&J White Chocolate Almond Bark (do not stir). In a small bowl, beat eggs until foamy; gradually add in sugar. Stir in almond bark mixture and almond extract. Combine flour and salt; gradually add to egg mixture until combined. Spread half of the batter into a greased 9-in. square baking pan. Bake at 325˚ for 15-20 minutes or until golden brown. In a small saucepan, melt jam over low heat; spread over warm crust. 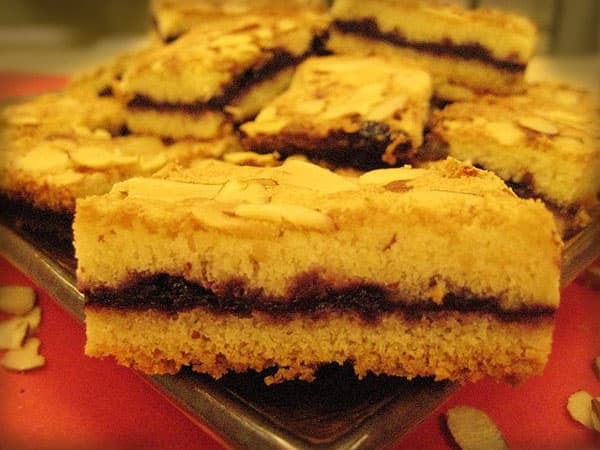 Stir in remaining almond bark into the remaining batter; drop by teaspoonfuls over the jam layer. Sprinkle with almonds. Bake 30-35 minutes longer or until a toothpick inserted near the center comes out clean. Cool on a wire rack. Cut into bars.